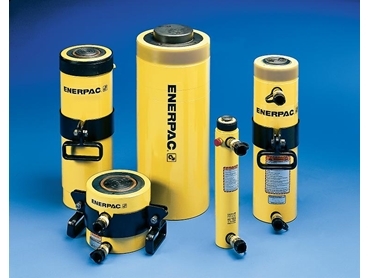 Robust long-stroke RR series hydraulic cylinders from Enerpac are especially designed for high-cycle uses in demanding environments such as construction, resources, mining, energy and industrial sites. The double-acting cylinders come in capacities from 10-520 tons, with strokes from 57-1219mm for applications such as bridge, roof, generator and mill positioning, as well as lifting, pressing, forming and fabrication applications. Long- stroke hydraulic cylinders feature built-in safety valve to prevent accidental over-pressurization. A CR400 coupler and dust cap is included on all models of the long-stroke hydraulic cylinders . The broad range of Enerpac long-stroke hydraulic cylinders, in capacities exceeding 2000 tons for custom-build models, is complemented by an extensive range of advanced pumping technologies. These range from simple portable hand pumps and versatile battery pumps to new generation electric and air-over-hydraulic technologies.